I left Washington DC in June and was amazed on a visit back this weekend how much seemed to have changed in the urban environment in this short time. The biggest change I'm thrilled about is the launch of a new shared bike scheme - Capital Bikeshare - already now the biggest in the USA. A previous scheme, Smartbike DC, has been operating since 2008 but never caught on. It's network of a mere 10 locations was woefully insufficient to constitute a new form of transport and they required you to join online first, for a flat fee of $40, before you could use a bike. Compare this to Capital Bikeshare's 1100 bikes at 110 stations stretching from Columbia Heights down to the Mall, East as far as Eastern Market and West into Northern Virgina. It's a dense-enough network to use the bikes as genuine public transport - you can feel secure that there will be a parking station sufficiently close to where you are going. One person I spoke to over the weekend wasn't confident the new scheme would catch on any more than the last one did, opining that those who liked riding already had bikes in most cases. But I think this is no different to the co-existence of private car usage and taxi cabs. As a bike owner and daily commuter I can imagine many scenarios where I might not want the hassle of keeping track of my bike, or only need to go one way, or am transferring to a car, where a shared bike scheme provides the perfect compliment to my private bike ownership. I rode bikes three times last Thursday getting from one meeting to another and it was wonderful. Cheap ($5 for a day membership, $25/month, $75/year, with use of the bikes free for journey's under 30 minutes), easy (30 seconds and I was joined and away) and fun. And useful! Much more efficient for piecing together my destinations than trains or buses would have been. For a visitor it's a wonderful way to get around. Combined with this DC has expanded their bikes lanes, already the best I've seen anywhere in the US. There are dedicated bike lanes every few streets, making it easy to get within a block or two of anywhere you want to go without dodging traffic. Some of these lanes are sectioned off from traffic by bollards, or have a lane of parked cars between bikes and traffic, making them extremely safe for cyclists. Very impressive, DC. 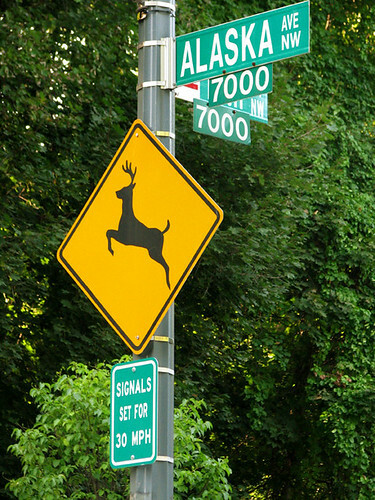 Combined with new light rail lines and the expansion of the Metro out to Dulles airport the District is evolving into one of the most walkable and least car-dependent cities in the country. As you might have heard (or lived through) DC got a bit of snow on the weekend. A record-setting amount of snow actually, an amazing 20 inches in 24 hours, near shutting the city down. Lots of funny and strange things seem to happen at times like this, and perhaps the strangest story to come out of what was dubbed snowpocalypse09 was a huge public snowball fight on the corner of 14th and Ust NW, in the heard of the U St shopping and dining district, at 2pm on Saturday. At some point during the ruckus, which had about 200 participants, some snowball enthusiasts decided to target passing cars, and in particular a massive Hummer. I can understand their desire, there's no car that more makes me want to participate in acts of civil disobedience than the Hummer, a converted troop carrier for god's sake. Anyway this particular Hummer contained an undercover police office, who got out of his vehicle brandishing his gun. At people bearing snowballs. Madness. It was all captured on camera thankfully and the detective is now “confined to desk duties” while the incident is being investigated. A lively snowball fight on D.C. streets took a dark turn Saturday when anti-war protesters dressed in anarchist garb showed up, and a D.C. police officer pulled his weapon out of his holster. But things started to turn for the worse when the crowd -- some carrying anti-war signs and dressed all in black with masks -- began to pelt passing cars. A plain clothes D.C. police detective emerged from a Hummer -- it's unclear whether it was his personal vehicle or an unmarked police vehicle -- after it was struck. The detective began yelling at the gathered crowd. At one point, he pulled back his jacket, exposing his service weapon -- it's unclear if he did this intentionally. That's when things took a darker turn. So they blamed a group “dressed like anarchists” for causing the problems, and indicated that the undercover detective only showed his weapon rather than brandished it, and that the only gun drawn was by a policeman who arrived later. Okay, a couple of things here. Firstly, the “dressed like anarchists” bit. By this we can only assume they're referring to people wearing balaclava's and scarfs around their faces. But aside from the seemingly omni-present anarchists (and bank robbers) who wears this sort of get-up? You got it – people in cold places! Like places where it's snowing like crazy. Like DC on Saturday. Secondly, re the gun, see the video above. There's enough evidence online that there's no excuse for a professional news operation, reporting hours after the event, to get this wrong. So besides being an example of a police officer completely overstepping the bounds of their authority it's also an example of the media completely overstepping their bounds of reporting, adding their own spin while blatantly mis-representing the facts, and doing so on the side of authority. This happens all the time of course, and this particular incident may not be the most important example in the world, but it is illustrating nonetheless. Protests in particular always get this treatment by a new media which is part of the status quo being protested. Not that this was even a protest, but the media were all too keen to fit it into their knee-jerk protest narrative of rowdy kids and put-upon police. On a more personal note I had a productive snow weekend. Firstly K and I made a film with our flatmate D entitled Kiev: City of Love. It's a beauty I think you'll agree, we're very proud of it (My second film ever!). What do you think, time to get a pilot to the networks? Then our visiting mate Scott and I made this snow Loch Ness Monster which is honestly the best snow sculpture I've seen since the dump. A weekend well-spent! My apologies for the blog silence this past week. We moved house on the weekend, didn't get internet until early this week and I have been preoccupied with unpacking boxes and building furniture to get on my computer in the evening. But things are settling down and I'm back into it. It's exciting to be in a new place in a part of DC I haven't explored much: LeDroit Park, near the NW/NE border. LeDroit Park was originally a whites-only neighbourhood in the late 19th Century but is now a primarily black neighbourhood, although it is, as they say, "up-and-coming", by which they mean more white professionals are moving in. Like us. It's fun discovering this new (for us) part of town, it has a different vibe from Mt Pleasant, the suburb we lived in (and loved) for the past year. We're within walking distance of the 9:30 Club, DC's premier live music venue, and not too far from U St, a strip of cafe's, restaurants, bars and shops. Our living situation has changed also, K and I have moved in with a couple of friends. I will miss living just the two of us but it's also cool to be back in a share house, which was always our set-up back in Sydney. This has allowed us to drop our rent while upgrading our facilities. The new house has a huuuge kitchen, massive common room with two fireplaces and our room has a fireplace and ensuite jacuzzi. Pretty nice. We do have to deal with a pretty relentless amount of traffic noise and very bright street lights outside our big bay windows, which for the first couple of nights, before we got curtains set up, kept us awake and then woke us up early, but we'll inevitably get used to it. Whereas before we used to like to say we were neighbours of Barack Obama, as we lived just off 16th st, which runs down to the White House, now we live just off North Capital St, which runs directly to the Capital Building, so we still have that visual reminder that we live in the heart of the empire. Have you ever looked at the predators in the zoo and wondered if, given the chance, they could still do their thing? Well I have, and for the lions at Washington DC's National Zoo consider the question answered! The National Zoo is the rare zoo that has actual wild animals running through it, thanks to it being free, which allows gates to sit wide open all day, where there are gates at all. On my first visit to the zoo a couple of years ago I got an enormous shock as a door deer dashed across my path, used as I was to only seeing animals on the other side of the fence.